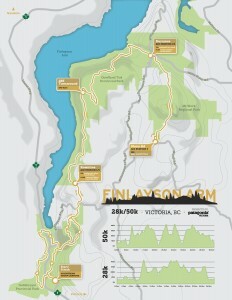 The Finlayson Arm 28k/50k/100k, is a mix of single track, double track and coastal mountain trails. The race begins at Goldstream group campsite trail head at Goldstream Provincial Park in Victoria, BC. Immediately after the start, runners will cross the Goldstream River in calf deep water! The race has numerous difficult climbs ascending Mt. Finlayson, Mt. Work, and Mckenzie Bight to Jocelyn Hill. Everyone is greeted by awesome views from all three of these difficult climbs and unless it’s a drought, Cascade Creek Waterfall climbing out of McKenzie Bight (for the 50k and 100k). Want to know more about the event from a runners perspective? Check out our Race Report page! The 50k (which is actually 52.5k) soars to a total elevation gain of 10,075 feet. The 100k (which is 105k) is two loops of the 50k course with 20,150 feet. Aid #1 (Rowntree Road at Rowntree Trail) @ 11.1km. No Cut off. Aid #2 (Ross-Durrance Road at Mt. Work Parking Lot) @ 23.2km. No Cut off. Aid #3 (Munn Road – South end of the Mt. Work Summit Trail at Parking lot) @ 28.2km. No Cut off. Aid #4 (Ross-Durrance Road at Mt. Work Parking Lot) @ 33.5km. No Cut off. Aid #5 (Rowntree Road at Rowntree Trail) @ 45.6km. No Cut off. Aid #8 (Ross-Durrance Road at Mt. Work Parking Lot) @ 75.7km. No Cut off. Finish line for 100k (105km): Cut off at 26 hours or 7pm. This is to ensure the safety of our runners, volunteers and the general public who are using the trails and to ensure we stay within our permits. Cut offs will be strictly enforced for this reason. The 2019 Finlayson Arm 100k will earn participants who complete the event 5 ITRA points towards qualifying for the Ultra Tour de Mont Blanc (UTMB) and it’s other events such as the TDS and CCC. Finish line for 50k (52.5k): Cut off at 12 hours or 7pm. The 2019 Finlayson Arm 50k will earn participants who complete the event 3 ITRA points towards qualifying for the Ultra Tour de Mont Blanc (UTMB) and it’s other events such as the TDS and CCC. The 28k climbs to a spectacular lookout and back with a total elevation of 4,400 feet. Aid #1 (Rowntree Road at Rowntree trail) @ 11.1km. No cutoff. Check out our 2015 race video done by Project Talaria! Package pick up will take place starting 2 hours prior to your race starting at the Goldstream Group campsite (aka the start/finsh line). You will be able to pick up items you pre-purchased and pick up some swag too! For the 50k and 100k runners, you can drop your drop bags off at package pick up. Aid stations will have water, GU gels (assorted flavours) and GU Brew, coke, ginger ale, fruit and various other ultra fare. Aid stations have been known to stock brownies, gluten free cookies, mini vegan cinnamon buns and other terribly yummy baked goods. We do our best to ensure we have an assortment of food at our aid stations! 50km and 100km Athletes have the option to have drop bags delivered to Rowntree aid station and Durrance aid station. Drop bags will be returned to the finishing area once the event is complete. Drop bags that are left behind will not be mailed back to the participant. If you cannot stick around after your event, you can pick them up Sunday during the 28k event. PLEASE LABEL YOUR DROP BAG WITH YOUR NAME AND BIB#. Crews are required to park in designated parking spots. We will have a suggested parking areas to assist your crew in meeting you. Certain roadways in the Highlands are for Local Traffic Only. See out Race Policy page for more details! Please note that you must have completed a Mountainous (greater than 5000 feet of gain) trail 50k or greater distance run between January 1, 2017 and August 30th, 2019. Not being able to to prove you have this requirement will remove you from the race.